Find a vacation home to rent in Lajatico from our list of vacation rental properties. Campaya has over 15 vacation homes available in Lajatico, which give you the possibility to locate a unique accommodation in Lajatico which completes your check-list in search for the perfect self catering vacation apartments in Lajatico or vacation villas in Lajatico. Marvelous holiday home with private swimming pool, on a hilltop near Lajatico, close to Volterra, in splendid panoramic position. Charming apartment with panoramic terrace, obtained from the attic of an old building located in the well-kept medieval village of Orciatico. This cosy holiday apartment is located in the attractive centre of Lajatico, a lovely place where warm hospitality is part of the local culture. This apartment is located on Pisa green hills 4 km from Lajatico, part of a 400-hectare farm producing biological food. 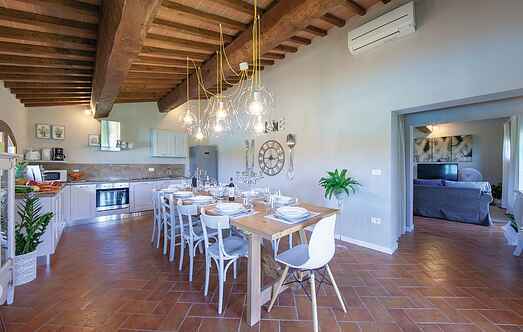 This first-floor apartment is located on Pisa green hills 4 km from Lajatico, part of a 400-hectare farm producing biological food.